The Melia Puerto Vallarta is a family friendly modern luxury all inclusive resort. It is situated on a beautiful stretch of Puerto Vallarta beaches.The room choices are all spacious and every room has a jacuzzi on the balcony. Their rooms range from a studio that can accommodate four people right up to a two bedroom lock off that can sleep ten guests. I must say that their three hundred and twenty five rooms look very impressive! They also offer a new M-Experience that includes meticulous service, modern accommodations and magnificent views. They have three different kids clubs starting at four months old right up to thirteen years old. Sounds like moms could really take a break here. The Melia has the largest swimming pool in Puerto Vallarta with two areas for the little ones. This all inclusive Puerto Vallarta resort has a 24 hour snack bar and five restaurants and three bars. Conveniently located near an 18 hole championship golf course and Marina Vallarta. You can experience archery, rifle shooting, dance lessons, Spanish lessons and play tennis. Lots of choices for water sports and of course a spa and gym. Melia Puerto Vallarta has activities all day long and you can join in on any of them. Now if you like thrills, they have something called the crazy jumper but it does cost extra though. Nightly shows are also performed on their live stage. After all that, you can go to their lobby bar for some more fun. They have a DJ and offer karaoke singing on certain nights. 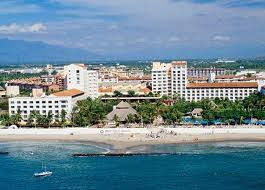 The Melia Puerto Vallarta is a wonderful all inclusive Puerto Vallarta resort. The kind you would like to stay at for awhile and just enjoy all it has to offer. If you do decide to book here, do not forget to sign up for their MAS rewards card.